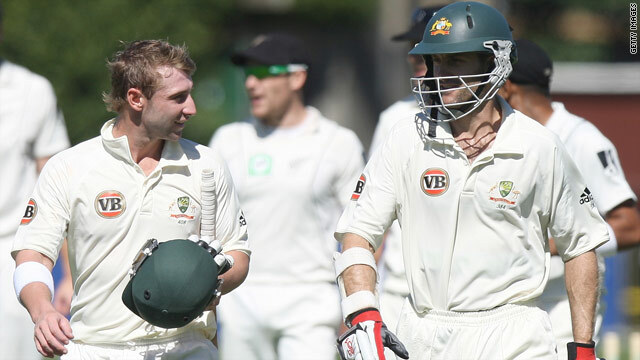 Australian batsmen Phillip Hughes (L) and Simon Katich leave the field after they secured a ten wicket win over New Zealand. (CNN) -- Australia completed a comprehensive defeat of New Zealand in the opening Test match between the two countries in Wellington while England closed in on a series whitewash in Bangladesh. Opener Phillip Hughes led his side to victory on day five, hitting an unbeaten 86 as Australia chased down their target of 106 without loss. New Zealand resumed on 369-6 but could only add 38 to that total. Brendon McCullum top scored making 104. Ryan Harris claimed two wickets in the morning session to record figures of 4-77. Hughes hit 12 boundaries and a six in his brisk 75-ball innings as Australia took a 1-0 lead in the two Test series. The second Test begins in Hamilton on Friday. I'm happy with the way the bowlers have stuck at it the last couple of days. After the match Australia captain Ricky Ponting told reporters: "I'm happy with the way the bowlers have stuck at it the last couple of days. "We've been in the field for the last four days so they are all a bit tired and sore. We'll give them a couple of days off to make sure they are in as good a shape as they can be for the start of the next one." England had a successful day in the second Test against Bangladesh in Dhaka. The visitors posted a first innings total of 496 largely thanks to Ian Bell's 138. Tim Bresnan made his highest Test score of 91. In their second innnings Bangladesh lost quick wickets. Fast bowler Stuart Broad picked up the scalps of Imrul Kayes and Mushfiqur Rahim, while spinner Graeme Swann dismissed Tamim Iqbal and Jahurul Islam. At the end of Tuesday's play Bangladesh were 172-6, a lead of just 95 runs. England must take quick wickets on the final day if they are to record another victory and seal a 2-0 series whitewash.